The Jewish holiday of Passover commemorates the Israelite's exodus from slavery in Egypt and celebrates their liberation while recognizing their hardships. On the first two nights of the seven- or eight-day holiday, a Seder is held where families tell the story of Passover, using the Haggadah (the written Seder guide) as well as several symbolic foods. Most of these foods are on the Seder plate, which is the centerpiece of the table. The foods are used to add a sensory element to recalling the Passover story. This leads to a deeper experience beyond the words and prayers. 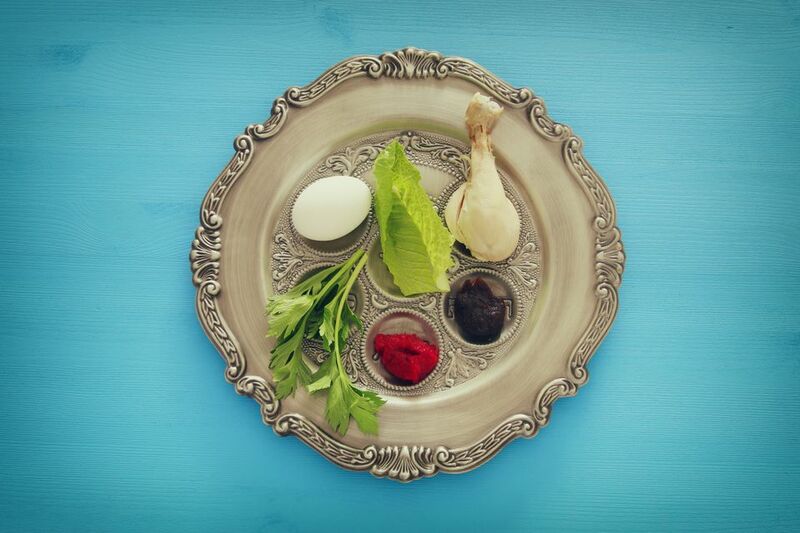 The Seder plate is an important part of the holiday service and dinner and is often a special dish with six designated spaces for each of the symbolic foods. Some families have beautiful silver or china plates, while others may use a paper Seder plate, which can be decorated by the children of the household or purchased with imprinted designs. That being said, a plate is not actually required—you can simply set out a napkin and place the ceremonial foods on it if need be. No matter what type of Seder plate is used, the symbolic foods presented are generally the same. However, family customs vary, so you may experience a different selection of food items if you are visiting friends or you have a different family tradition. Most of the ceremonial foods for Passover are presented on the Seder plate and should be prepared or purchased in advance. Although there is variance when it comes to the representative foods, there are a few items that are always the same: the lamb shank bone, an egg, and horseradish. Each food sits in the space labeled by its Hebrew word. Karpas is a vegetable, preferably parsley or celery, representing hope and redemption. It is served with a bowl of salted water (Ashkenazi custom) or vinegar (Sephardi custom) to represent the tears shed by the Israelites. After the kiddush (blessing over the wine), the parsley or celery is dipped into the saltwater and then eaten. A bitter herb, usually horseradish, is used to symbolize the bitterness of slavery. Either a piece of fresh horseradish or a spoonful of horseradish is placed on the plate. During the service, a Hillel sandwich is made, combining the maror (or chazeret) with charoset between two pieces of matzoh. Chazeret is a second bitter herb in the form of a bitter green, often romaine lettuce or endive. Some families will include it as such on the Seder plate, while others will use horseradish twice; other seder plates will not include it at all. A mixture of apples or dried fruit, nuts, wine, cinnamon, and other spices, charoset is a reminder of the mortar used by the Jews as slaves in the construction of buildings for the Pharoh. There are many recipes and variations. A roasted egg symbolizes life and the perpetuation of existence. You can use a hard-boiled egg or roast the egg in its shell in a 375 F oven, turning the egg often as the shell browns (about 20 minutes). The egg is eaten during the meal, often dipped in the salt water which is also provided. Traditionally, zeroah is a piece of roasted lamb shank bone, symbolizing the Paschal sacrificial offering and the outstretched arm of God. If it is difficult to find a lamb bone, you can use a poultry neck or wing. Roast the bone in a 375 F oven for about 30 minutes. The zeroah is not eaten at the Seder. In addition to the Seder plate, there are a few other food items necessary for a proper Seder. Matzoh, traditional unleavened bread, is not placed on the Seder plate but does have a prominent spot on the table. Three pieces of matzoh are placed within the folds of a napkin as a reminder of the haste with which the Israelites fled Egypt, leaving no time for the dough to rise. Two are consumed during the service, and one (the Afikomen) is secretly hidden during the service to be later found by the children; the winner often gets a prize. Passover meals can vary from household to household, but one thing they will all have in common is that the menu will not include hametz, foods forbidden during the holiday. These are any foods that are leavened or made with a leavening agent. Depending on whether the Passover Seder host is Ashkenazi or Sephardi, the foods that are allowed will differ—for example, Sephardic Jews will eat rice during Passover while Ashkenasic will not. In addition to the traditional foods, four glasses of wine are consumed during the service to represent the four-fold promise of redemption, with a special glass left for Elijah the prophet who "visits" during the Seder meal.